If you're look for additional backup for your iPhone photos and videos, Shutter by Streamnation has an interesting proposition: unlimited storage for free. 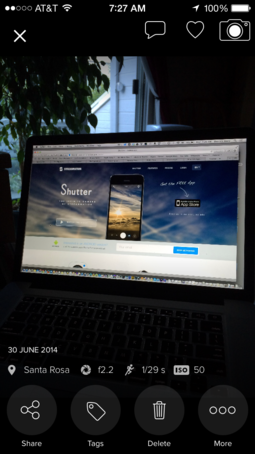 Their iOS app, Shutter combines a useful camera with a clever storage service, and lots of sharing features. One of the things that initially caught my eye was the fact that I could capture an image in Shutter, then open it directly in Instagram. When you're taking pictures with either an iPhone or iPad with the camera function, you have the basic features you'd expect: focus point, flash control, and a handful of filters. Nothing fancy, but it certainly gets the job done. 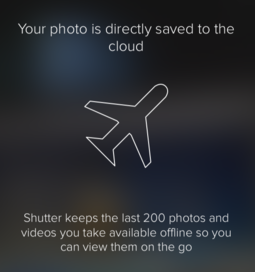 Beyond that, Shutter saves all of your photos and videos to your account, keeps the last 200 available locally in case you don't want to use bandwidth to play with them, and will even automatically backup your existing camera roll. You can save your Shutter images to you camera roll (or leave them in the Shutter app), post them online, or email to a friend. The sharing options are strong with good connections to Facebook, Twitter, and Instagram. Because we've had some bad luck with great services closing down in the past, I don't recommend putting all of your backup eggs in this basket. But I think it's worth testing and using as a redundant service to your primary archiving system. I'm particularly interested to see how this all ties together with the StreamNation app that I've loaded on the iPad that lets my manage the content I have in their cloud service. I'm on the road in a week. That will be a good opportunity for further testing.